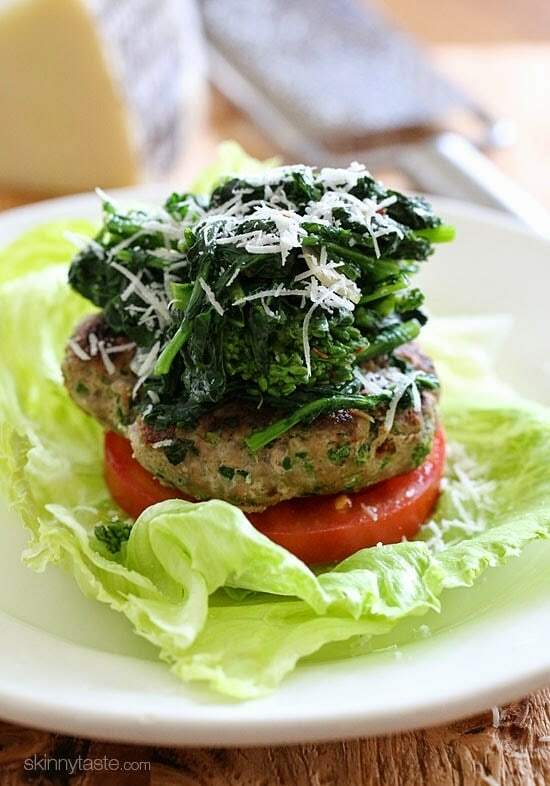 These Broccoli Rabe Turkey Burgers are deliciously flavorful – I skipped the bun, served them over lettuce and topped with sauteed broccoli rabe – a perfect quick weeknight meal! This would also be wonderful on a slice of focaccia. I love having naked turkey burgers for light lunch. A few of my other favorites are Naked Greek Feta-Zucchini Burgers, Naked Turkey Bruschetta Burger, and Buffalo Turkey Cheeseburgers with Blue Cheese Broccoli Slaw. I adore slightly bitter taste broccoli rabe. Sauteed with garlic and oil and a pinch of red pepper flakes, it’s one of my favorite vegetables. My local organic supermarket carries incredible chicken broccoli rabe sausage, which is where I got the inspiration for this burger. 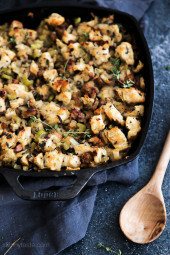 I tried making it with ground chicken and ground turkey, and preferred the taste and texture of the turkey. To make the patties, I simply chopped up some broccoli rabe and added it to the meat along with Pecorino Romano and garlic. My husband loved them too, enjoy! 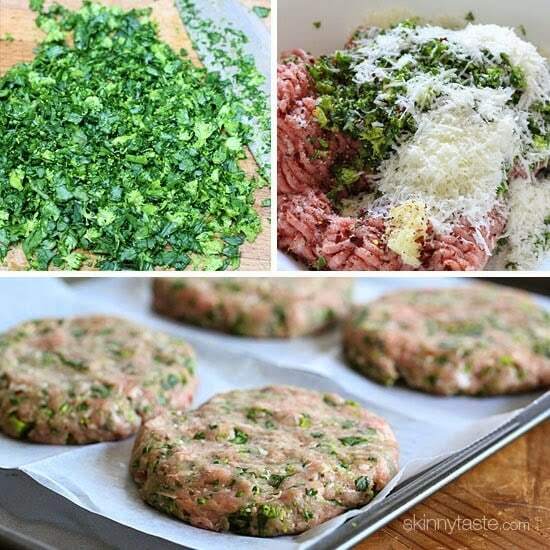 These Broccoli Rabe Turkey Burgers are deliciously flavorful – I skipped the bun, served them over lettuce and topped with sauteed broccoli rabe – a perfect quick weeknight meal! Chop about 3/4 cups worth of leaves and flowers only of the broccoli rabe into very small pieces and set aside for the burger. Cut the remaining broccoli rabe into 2-inch pieces. Bring a large pot of salted water to a rolling boil, then add the broccoli rabe. Blanch for about 1-1/2 to 2 minutes, drain well and set aside in a colander. Meanwhile, in a medium bowl, combine the turkey, 3/4 cup chopped broccoli rabe, Romano cheese, garlic, salt and pepper (red pepper flakes too if using). 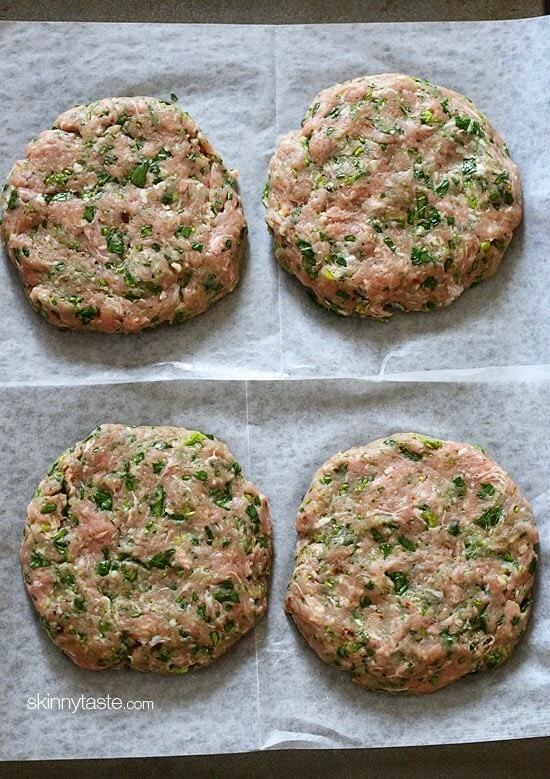 Form into 4 patties and refrigerate until ready to cook. Heat a large, deep sauté pan to medium-high heat, when hot add the olive oil and garlic and cook until golden about 1 minute, careful not to burn. Add the broccoli rabe to the pan and toss with garlic and oil, season with 1/4 tsp salt and crushed red pepper; cook about 2 to 3 minutes, or until heated through. While that is cooking, cook the burgers on a hot skillet over medium-high heat for about 6 to 7 minutes on each side, or until cooked through in the center. To serve place a lettuce leave on each plate, top tomato slice and cooked burger. Finish with the cooked broccoli rabe and optional more grated cheese if desired. I made these by using some leftover cooked broccoli robe, just chopped it up and mixed it in. I also added about a tablespoon of whole wheat bread crumbs to the ground turkey, helped it firm up a bit. I wish I would have made the patties thinner, they were a little bit too thick and took forever for the inside to cook. Anyway, so yummy!!! Wow, it looks so delicious, I like it. 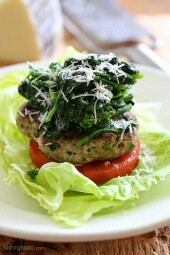 Hi Gina: I just made the burgers with rapini and forgot the cheese but I didn't miss it at all. They were so delicious and I ate all the rapini! Thanks for a great site. I appreciate all the help with using my points well. 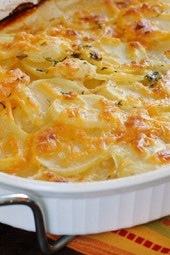 We just had these for dinner last night and they were amazing!!! However, we didn't have the broc. rabe and wanted to use the rest of the spinach so we substituted. We also added in some bell peppers that were starting to go past their expiration date as well as mushrooms. It still tasted great and extremely filing. I added a 2 point bun to make it even better. You can use any veggie really! So happy you liked them! Sure, freeze them uncooked! These are very freezer friendly! I live alone and am wondering whether if I make the full recipe, would the burgers freeze OK? I'm thinking I would wrap them individually and freeze uncooked. Then thaw before cooking. 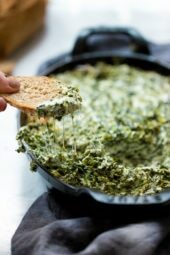 I love broccoli rabe and this is an interesting, fun way to serve it! Gina, do you cook the chopped rabe first? Is it too bitter otherwise? No I don't cook the rabe that goes into the burger, and in the burger its not bitter at all. Would the patties hold together well enough to cook on a grill rather than in a skillet? Ours held up well on the grill, and they were pretty loosely packed! Yes, I also find refrigerating them first helps keep them together perfectly. I've had the same chicken sausage, so I know the flavor combo is amazing GREAT idea for a burger!! So light without a bun too! Had never done turkey burgers before I started getting your recipes and now I am loving all the variations. All the extras add so much flavor, even DH doesn't mind not getting beef. They are a special thing in their own right not a substitute being compared to a burger if that makes sense. I agree with you completely. I find them so flavorful, they don't even need a bun. But I wouldn't exactly say they taste like a beef burger. Quick question, for your ground turkey do you use turkey breast or just regular ground turkey? Thanks! Her recipe says 93%; I think the breast is usually 97/99% and would probably be a little too dry. Not turkey breast, that would be so dry. Spectacular burger. Adding a piece of fococcio bread though I must confess! Makes me feel a little manlier, you know, the roll bit. Can't just have just a bit of lettuce. Great way to sneak a little broccoli in my diet, sure need those veggies. Thanks! This looks delicious. I love broccoli rabe but my husband does not. I wonder if I could sneak it into these burgers and he wouldn't mind. Either way he would grill them. Lovely! My husband liked them, and he's not a fan either. I didn't put broccoli rabe on top of his, I topped his with mozzarella. Sound amazing Gina! I made some turkey burgers yesterday with courgette and they were super moist and love them now! Definitely going to try these out! These sound and look absolutely delicious! I haven't made burger patties at home in ages! I am trying this! I LOVE broccoli rabe! I love this idea! I can make it paleo friendly for my right now by omitting the cheese! Can't wait to try it! Love your blog! Yes, I was going to suggest that! Thank you!